Happy Friday! Amy here, with one more Big + Little layout. For this layout, I was restricted to a small photo because the camera I had with me on the day in question wasn’t working properly, so the only pictures I had to work with were pretty awful. Grainy and blown out and more than a little bit soft. (I did, in fact, retire said camera after this day.) But I still wanted to scrapbook the memory. So I printed the photo in black and white, on textured cardstock so the grain could camouflage some of the flaws. And then I wrote quite a bit—even about the photos I wish I had been able to take. When I do a pairing like this—big journaling space, small photo—I like to work the photo right into the middle of the text somehow. It helps the photo to feel more prominent and the combination to feel more cohesive. In this layout, I put the text into columns and then used a text box with the dimensions of my photo to create just the right spot for the pic. 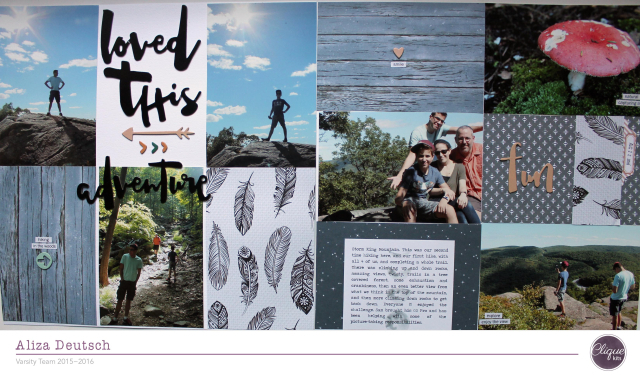 How do you incorporate lots of journaling onto your layouts? Hello! Welcome back to WCS and another day of big + little pairings. One of my favorite things to do on a layout is use a quote as my title. I would guess about 10% of my layouts use this approach. To me, a "quote" is anything that was written or said by someone else (usually famous in some capacity, although I have used a friend or family member's words as quotes, too) that is so striking in its use of language paired with idea that I get a little bit swoony. (Remember...I'm a word girl at heart.) I have a big collection of quotes and I'm always adding to it. So last week, when my friend I've known since junior high shared a picture of me from one of our sleepovers in 1984 or 85, I had two thoughts: even though I look like a goofball, I must scrapbook this picture right now and I know exactly what quote to use! The quote, from Coco Chanel, is the title, of course. And my words—I loved those bead necklaces—is the smaller subtitle. I like the way the repetition of the font (it's called Alegance, if you're curious) helps draw the eye from the title, through the story, and then out of the page. Even though the subtitle is the little thing in the pairing, it helps give the layout a finished look. I don't have a ton of photos of myself as a teenager in the 1980s (one of the great tragedies in my life! ), but I have made a few layouts with the ones I do have. This is always a hard process for me because almost nothing in the aesthetics of 20-teens scrapbooking really matches the aesthetics of the 1980s. I find that I tend to use a lot of cardstock or almost-solid patterned paper for these layouts, because more obvious patterns feel like they just don't match somehow. (If any manufacturer ever made decade-inspired products, I'd probably buy some!) But I almost always use the font Perpetua for my journaling. It feels timely to me—a chunkier sort of serif. So, I'm curious: Have you ever scrapbooked any photos that scream "I was taken in the 80s"? What supplies and approaches have you used? It's April and we are celebrating all things funny this month. Our gallery this month is No Foolin' and it is sure to make you giggle. 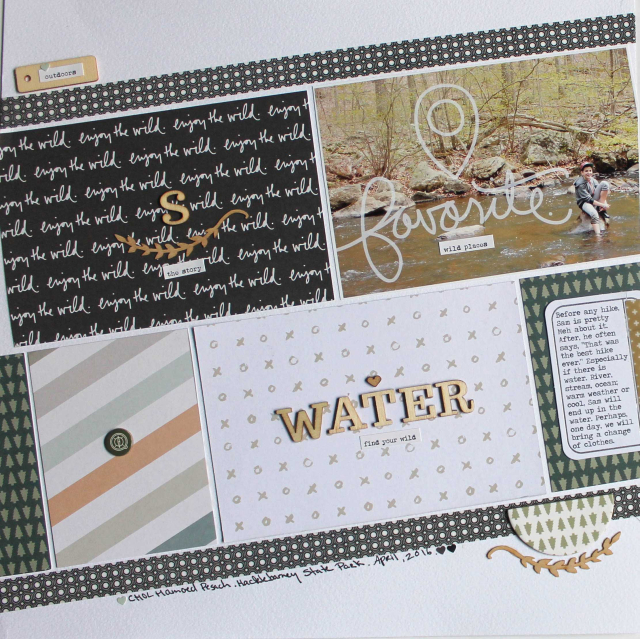 If you would like to see the layouts and read the journaling, please hop on over to our gallery! Enjoy! No really. I love, love books. I always have three or four different things I'm reading and 127 or so things I want to be reading. I talk about books, write about books, think about books. They are my favorite decoration in a room. So I'm contractually obligated to also scrapbook about books (and reading). 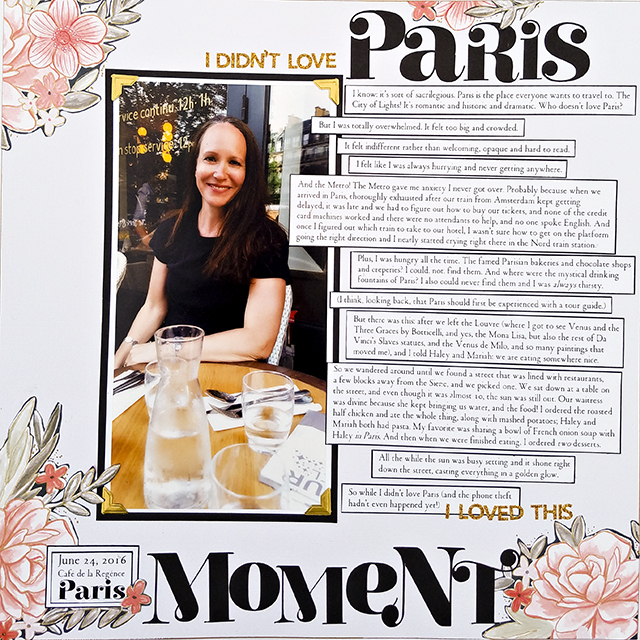 Throughout my twenty years of scrapping, I've made quite a few book-related layouts, so I thought for today's post I'd share some tips and tricks for getting books and reading into your scrapbook albums. 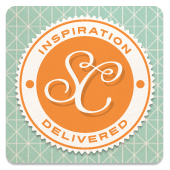 If you come across a book-themed supply that you love, buy it.Especially if it fits well with your design aesthetic. It's a theme that comes up sometimes, but not always. So grab it when you find it. I have two book-themed stamps and I've used them a bajillion different ways on reading layouts. But don’t feel bound to use theme-based supplies. Book spines are easy to make! Take pictures of your kids reading. Maybe that seems obvious, but it’s such a common, everyday sort of activity it’s easy to overlook. I've had to be stealthy about this sometimes, especially with my child who doesn't love reading. The easiest way to interrupt someone reading is to make a fuss with a camera. My favorite reading-related pics are the ones where the subject is immersed in his or her book. Document board books. There is something special about the connection babies make with their board books. All of our favorites are drooled on and coming apart, but they were so important to my kids' childhood that I kept all but the most disheveled. What were your favorite board books to read to your babies and which ones filled you with despair at the very thought of having to read them one more time? (Goodnight Moon and Pat the Bunny​, respectively, are mine.) Were any of the books gifts from someone special? What did your kids love and what did they learn from the stories? If you don't have a photo but you have a notable book-related story, tell the story anyway. In this layout, I paired a photo of my son jumping on the trampoline (he's just finishing his finally-perfected full twist) with a funny reading-related story. The picture has absolutely nothing to do with the story, except that it comes from the same time period. I connected these with a quote from Roald Dahl, who is an integral part of the story. I also could have taken a picture of the books in question, or found an image with the authors' signatures. The point is, stories about books and reading are awesome, so document them even without pictures. Include reading details in your life-right-now style layouts. I like to make at least one layout every year that captures the everyday details of our lives, and I always make sure to include what the person I’m scrapping about is reading at the moment. In this layout, the journaling is a list of random stuff, but I added the details of what we were both reading on the tag with the date. Document generational connections. My three oldest kids all loved the Wrinkle in Time quartet and the Chronicles of Narnia, books I also loved as a kid. I’ve found these connections happen quite often once your kids hit high school, especially if they’re reading off of the AP list. Several times I’ve chosen to read whatever book one of my kids is reading in his or her English class, which makes it easier to help them with essays and gives you a thing to talk about. I’ve made layouts about all of those experiences. One of my favorites is the one about the Twilight series, which I read (and hated) because my daughter was reading it (she loved it); we had some really great discussions about romance, choice, and being influenced by others, so I had to document it. There are also connections the other way, from you to your parents or grandparents. I still need to make a layout about how my dad and I both loved The Lord of the Rings and East of Eden. Document your local library. Most libraries are just fine with people taking pictures inside, but if you feel unsure, just ask a librarian! Take some photos near your favorite pieces of art, compose an artsy shot of light streaming across bookshelves, or pose everyone at the entrance to the building. How often do you go to the library? What do you love about your library and what do you wish were different? What’s the biggest library fee you’ve ever had? 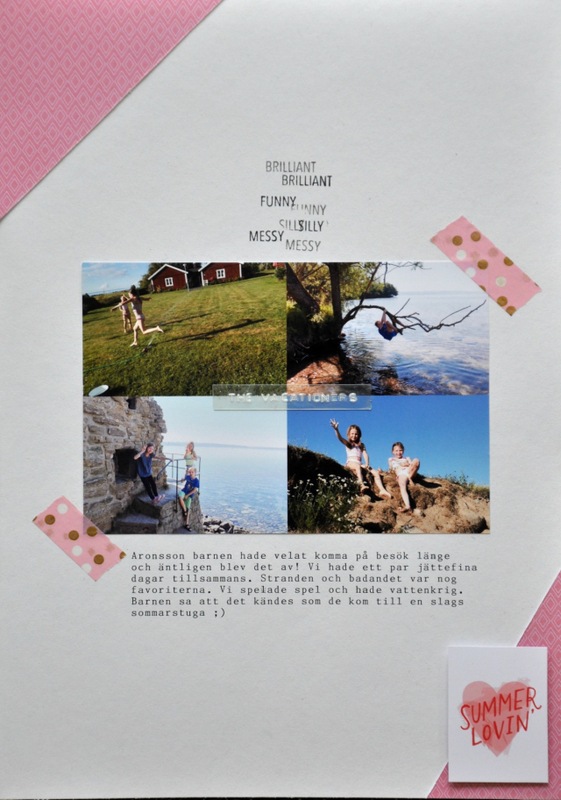 How have you included books and reading in your scrapbooks? Do share! And...dare I say, happy reading?